Big sports events are strengthening the recognisability of Ljubljana on the international stage and are influencing the positive image of the destination. The 11th European Championship is the last one to be organized biannually (from now on there is going to be a championship every four years), with 12 teams playing for the last time, next time there are already 16 teams participating. In the qualifications for the championship 47 European teams played, with Slovenia directly qualifying as the host. In addition to Slovenia, teams from Italy, Azerbaijan, Ukraine, Portugal, Spain, Kazakhstan, Russia, France, Poland, Romania and Serbia are playing. 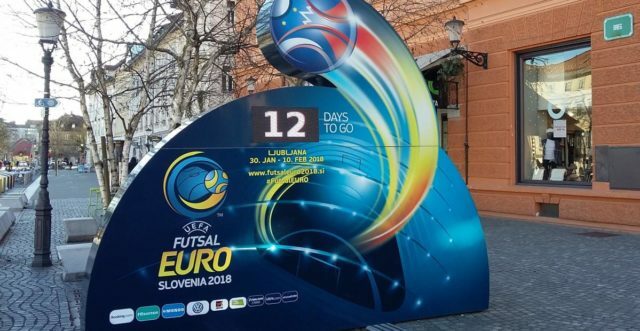 The championship is organized by the Football Association of Slovenia in cooperation with the City of Ljubljana and the public institute Ljubljana Sport and Leisure Facilities. In Ljubljana we recognize the importance of big sports events for our city, such as the European Futsal Championship and, for instance, the European Basketball Championship in 2013, as they are strengthening the visibility of Ljubljana on the international stage and are influencing the positive image of the destination, especially with regard to good organization, professionalism and the quality of the infrastructure and services. UEFA Futsal EURO 2018 is certainly going to contribute to the popularization and faster development of futsal in Ljubljana. The recently opened sports hall Baza in Štepanjsko naselje equipped for futsal is also going to help. You are invited to come to the matches at the Stožice sports hall or watch their live broadcasts in the House of Sports at Breg embankment! Further details can be found on the official website of the championship.